Welcome to Guadalajara. Mexico's second largest city with over 5 million inhabitants. 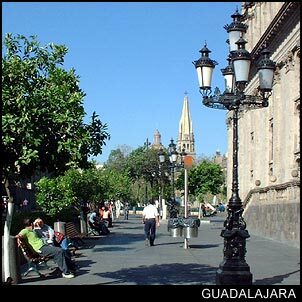 The charm of guadalajara rests with its Spanish colonial flavor (established in 1542). No visit to Guadalajara Mexico is complete without spending a day in the centro historico.The historic district is a nice blend of buildings (which are hundreds of years old) with pedestrian only streets, park benches, fountains, monuments and sculptures. In a large city full of traffic jams, noise, and the constant hustle of people trying to get from one place to another . . . the historic district is a great place to slow down and take in this beautiful center at your own pace. Guadalajara Mexico is 5200 feet high (1585 meters). The bottom line there is that while many other destinations in Mexico are too hot to enjoy being out and about in the summer, Guadalajara is just right. The added bonus being its close proximity to Mazatlan, Puerto Vallarta, and nearby Lake Chapala. When you combine the availability of nice affordable housing with the temperate climate and location . . . it is easy to understand why Guadalajara has become a popular place for Americans looking for a place to retire. We should not forget to mention shopping in the large mercado near the historic district. Deals you will find in these places make the trip worth it. Even if you are taking a short excursion to cool down away from nearby Mazatlan or Puerto Vallarta. Shopping in the large mercado is a must if you are looking for something that screams out, "Made in Mexico". . . Some of the best deals here include hand tooled leather saddles, cowboy hats, boots, blankets, home decor, curios and gifts. Guadalajara Mexico is a huge city with a lot to see and do spread out over a large area. So, if you don't plan on renting a car while you are here . . . be sure to reserve a hotel in Centro. That is where you will be closest to the main points of interest to someone visiting. If you plan on staying for a month or more . . . just rent a hotel or room in a hostel, and pay a local to help you find a place to rent once you are here. You will pay a lot more if you search the web for vacation rentals in Guadalajara. The key to living in Mexico is to live like the locals so you don't get charged like the tourists. Even if you have the money to spend, you will find a much nicer place for the money you have set aside for rent.